Nothin’ Fancy is very excited (and relieved) to introduce our newest bandmate: Jacob Flick! Jacob is a student at East Tennessee State University in Johnson City, TN. He is majoring in Appalachian studies with a concentration in bluegrass, and is among a new generation of bluegrass musicians who are pursuing the study of the music in institutes of higher learning. When not at ETSU, he hangs his hat in Singers Glen, VA. Jacob has been a fan of Nothin’ Fancy for years, and considered playing with Nothin’ Fancy “a dream job” ever since. The crew of Nothin’ Fancy are happy to make that dream a reality! He is an avid fisherman, collects vinyl records, spends time with friends and family, and of course spends a lot of quality time with his banjo. Let’s all give a warm welcome to Jacob as he joins the Nothin’ Fancy family! Mitchell Davis, a founding member of Nothin’ Fancy, has shown a track record of responsibility, punctuality and is a true entertainer, but most of all, a tremendous banjo player. Mitchell will always be a member of our Nothin’ Fancy family and will be missed. We ask our friends, families and fans to honor Mitchell’s decision and join us in wishing him well with each new day he faces. Based out of southern Virginia, Nothin' Fancy has been entertaining audiences for over two decades. With their bright music and flair for comedy, the band is always a crowd pleaser at venues around the world. Nothin' Fancy shares lightheartedness and sincerity with their audiences which is always warmly received. 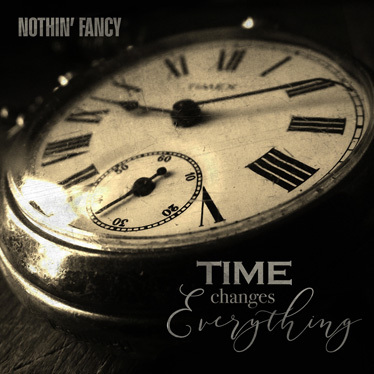 Time Changes Everything is the band's 15th album and will delight listeners just as much as Nothin' Fancy's past hit albums have. The project features two songs written by band frontman, Mike Andes and two songs from guitarist Caleb Cox. It also includes music from Carter Stanley, Glen Campbell, Bob Dylan, and Allen Mills. With this arsenal of songwriters, the lead vocals of Mike Andes and Caleb Cox, and the band's superb musicianship, this project will please any bluegrass fan's musical appetite.